Rossana, the highly innovative bespoke luxury Italian kitchen brand, have the international launch of its new kitchen K-In K-Out, Isola at the Saatchi Gallery in London on Thursday 9 February, in conjunction with Wallpaper* and with terrace designs by Jack Dunckley. K-In K-Out Isola takes the inside out and brings the outside in. It is one kitchen with one aesthetic but with both indoor (K-In) and outdoor (K-Out) versions it facilitates two different uses. Jack Dunckley has designed a contemporary 3D computer-generated imagery (CGI) roof terrace to showcase K-Out, which attendees will be transported to by using VR technology. 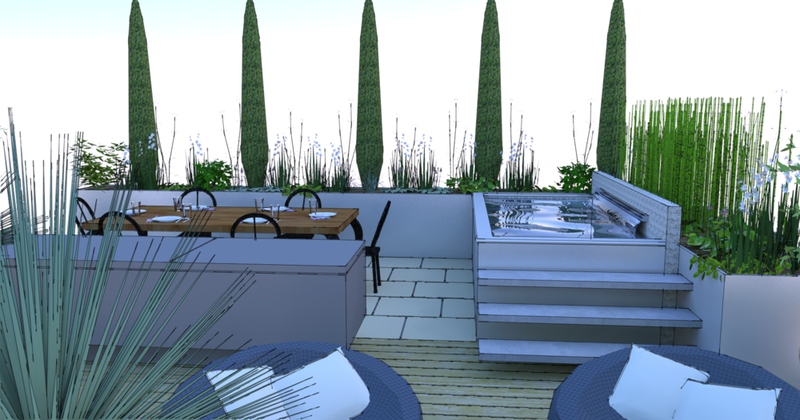 Jack has designed K-Out to be the main central feature of a virtual roof terrace, splitting the space into two areas: a state of the art dining area and a luxurious relaxing zone. In the dining area, a long Galbes table by Italian designers Baxter is nestled next to an elegantly tiled plunge pool. This has backlit cascading water and underlit cantilever steps in cast concrete on one side. Architectural cupressus sempervirens and equisetum hyemale are potted inside large powder coated stainless steel planters and border the area. Underfoot is sandy white porcelain paving and in one corner, a striking bronze sculpture which completes the roof terrace. The relaxing area has beautiful Iroko hardwood decking underfoot, which is a long lasting and stable material. 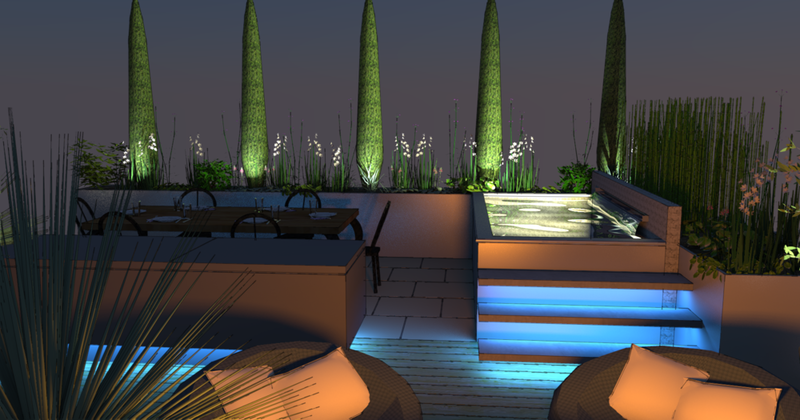 Contemporary seating surrounds a hand cast Solus Décor Fire pit, to provide warmth and atmosphere to the garden. Yucca rostrate and olive trees in Tuscan-style rustic terracotta pots line the garden and a glass and concrete balustrade borders the whole roof terrace. K-In K-Out Isola, designed by architect and company art director Massimo Castagna, look identical and feature a freestanding island unit which when closed looks monolithic yet also appears to magically float thanks to the dramatic overhang on the high, burnished steel supporting plinth. This stunning effect is further emphasised when the island’s cover tops are slid open, modifying its form and proportions and revealing appliances and work surface beneath. While both versions appear indistinguishable, their internal structure differs to provide maximum performance in either location. K-In features a steel framework with internal carcasses made from wood and patinated metals, whilst the framework of K-Out is made entirely from steel and is weatherproof. There are a selective range of finishes available including a natural grey stone with irregular veins in darker shades of grey to black, heat-treated elm, chestnut, eucalyptus and dark olive veneer, to name a few. Fulvio Brembilla founded Rossana in 1953 in Bergamo, Italy, naming the luxury kitchen brand after his wife. Brembilla chose some of the greatest contemporary Italian designers to collaborate with, including Giancarlo Iliprandi , Michele De Lucchi, Rodolfo Dordoni, Tito Agnoli, Christoph Pillet, Salviati-Tresoldi, Alfredo Zengiaro and Ennio Arosio and Massimo Castagna. In 1972, the design and innovative qualities of the brand were recognised at the Museum of Modern Art, New York, when one of its kitchens, Isola, designed by Giancarlo Iliprandi, was chosen for the exhibition, Italy, the New Domestic Landscape. Isola is today considered a design classic. During the 1970s Rossana became ‘the kitchen of the heart’ for all Italians and began to represent the stylistic and qualitative standard to which many furniture manufacturing brands aspired. When the San Marino-based Colombini Group bought the company in 2009 Rossana received fresh evolutionary impetus leading to the start of their innovative kitchen-system concept, a new way of planning the kitchen, which was more flexible and able to satisfy the customisation needs of even the most forward thinking customers. One of the models reflecting this new way of interpreting the kitchen space was HD23, designed by Massimo Castagna. With his latest design, K-In K Out, Castagna continues the theme of creating new designs that integrate into the entire Rossana collection. Consistently intelligent and hugely influential, Wallpaper* is the world’s most important design magazine. Wallpaper* has readers in 93 countries and unparalleled success in reaching the design elite across the globe. With 12 themed issues a year, over 1.3 million Twitter followers and a monthly iPad edition, Wallpaper* has evolved from style bible to internationally recognised brand.